Bust of Severus Alexander (Capitoline Museums, Rome). Julia Maesa, Elagabalus’ grandmother, persuaded her grandson to adopt his cousin Alexianus (born 1 October 208), who was just 12 years old at the time. She also convinced him that it would be wise to make him a Caesar, so that Elagabalus could focus on his religious duties, while Alexianus took care of more worldly affairs. And so it happened. Alexianus was adopted by a “father” who was just a few years his senior, and he was appointed Caesar in June or July of 221. Alexianus was now called Alexander, after the great Macedonian king. Although they were family, the two boys did not cooperate well and it seems their respective mothers, the sisters Julia Soaemias and Julia Mamaea, had a serious feud as well. On 1 January 222, Imperator Caesar Marcus Aurelius Antoninus Augustus (Elagabalus) and his adopted son Marcus Aurelius Severus Alexander Caesar (Alexander) became consuls. It soon became abundantly clear that Alexander was much more popular than his “father”, especially with the praetorians. The praetorians saw Elagabalus as an effeminate Syrian and mocked him for his make-up, his golden jewellery and his silk clothes. Alexander, on the other hand, was seen as a reasonable and modest lad, who had been tutored well by his mother Mamaea. This, of course, posed a serious threat to the emperor’s position. Mamaea tried to make her son even more popular with the praetorians by secretly giving them sums of money. Elagabalus responded by plotting against Alexander and Mamaea. He even wanted to strip Alexander of his title of Caesar. So the emperor wanted a beautiful death, but what he got was a miserable one. On 11 March 222, he was murdered by the praetorians in their camp. Cassius Dio claims the emperor made an attempt to flee by hiding in a chest, but he was discovered and killed in the arms of his mother, who also lost her life. The Historia Augusta, however, writes that Elagabalus was hiding in a latrine when he was tracked down and caught. In any case, the bodies of the emperor and his mother were stripped naked and dragged through the streets and the Circus, before being thrown into a public sewer. The sewer flowed into the river Tiber, but it was too narrow for the bodies. So the soldiers therefore picked up the emperor’s body again, increased its weight with rocks and threw it off the Pons Aemilius (nowadays the Ponte Rotto), into the river. Thus Elagabalus posthumously earned the humiliating nickname ‘Tiberinus’ (the Romans had a crude sense of humour…). 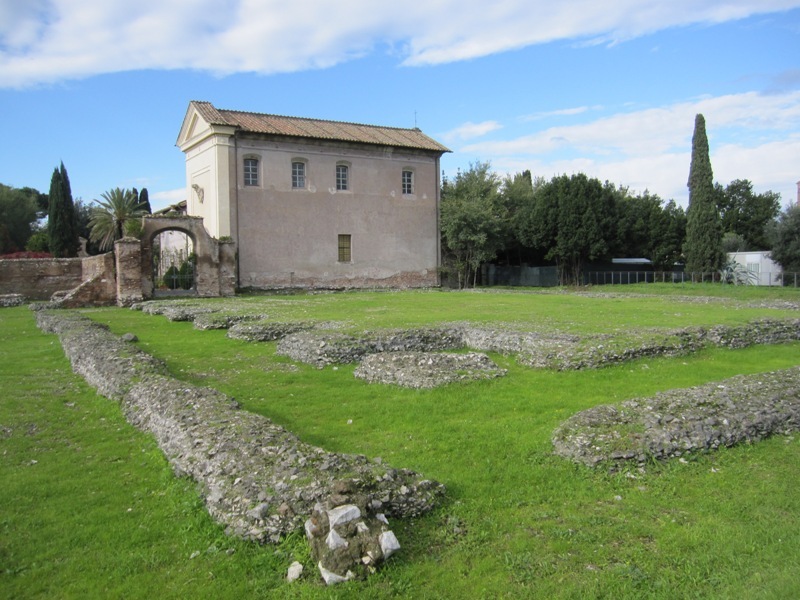 Ruins of the temple of Elagabal on the Palatine Hill. The soldiers rejoiced at the death of their hated emperor and now declared 13-year-old Alexander Augustus. Of course, since he was still very young, his mother and grandmother played an important role during his reign. They basically co-ruled the Roman Empire, with the help of the praetorian prefect (and famous lawyer) Domitius Ulpianus and a council of 16 senators. Here the young emperor consciously mimicked the emperor Caesar Augustus, who had ruled with an advisory council called the consilium principis. – Historia Augusta, Severus Alexander 14. – Adrian Goldsworthy, The Fall of the West, p. 81.